Members from the Swedish Parliamentarians, HDF Team and UBH staff pose for the group photo. 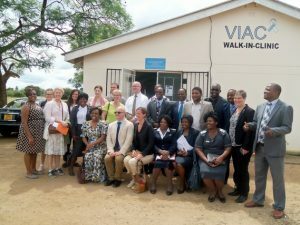 The Swedish Parliamentarians visited UBH on the 6th April 2018. UBH was chosen as the place to showcase to the Swedish Parliamentarians. UBH identified the areas of interest on the day of the visit. The areas identified were: Maternity labour ward, New Born Corner, Kangaroo room, VIAC, Youth Friendly Service and Maternal Child Care Centre. Leading the Parliamentarians was Ambassador Sofia Calltorp. The HDF team was led by Ms P. Darikwa the HDF Coordinator UNICEF. Dr. N. Dzvanga the Acting C.E.O and Mr. R. Sithole the Operations Director represented UBH. The tour of the identified areas was conducted by the Principal Nursing Officer Mrs C. Chivonivoni.